Many times when you lay on a bed in a mattress store, it feels good. But what really matters is how that mattress feels when you get it home — and how well it allows you to sleep. Here are some reasons to give memory foam a try. If you suffer from back pain and sleep on your old spring bed, you may wake up stiff and sore since your mattress doesn’t conform to your body’s curves — and throws your spine out of alignment. But memory foam molds to your body in whichever sleeping position your prefer, which sleep specialist Donna L. Arand, PhD, clinical director of the Kettering Sleep Disorders Center in Dayton, Ohio, says can facilitate comfort. And Kathy R. Gromer, MD, a sleep specialist at Minnesota Sleep Institute, says this may improve sleep. “It can, if it relieves painful pressure points,” she says. Feeling a partner tossing and turning all night can make it impossible for either sleeper to rest well, and traditional beds definitely allow that movement to be felt. But memory foam can help couples sleep better, according to Arand. Imagine sleeping on a million tiny bugs. Yuck! If your current worn out bed is made of springs, it’s a good possibility that pesky dust mites have burrowed inside along with their droppings, causing you to wake up sneezing and contested especially if you’re allergic. Since a memory foam mattress is so dense it doesn’t allow allergens like dust mites, mold, or pet dander to settle into the mattress, it allows for better breathing all night and into the morning. We build each mattress in our own Beloit, Wisconsin factory, just as we always have since 1929. Our family of mattress makers takes our time to carefully assemble each quality layer into an ultra comfortable bed that will help you sleep. It won’t sag within months or start to fall apart in a year. You can be sure it will last for many years to come. Whether you’re looking for a memory foam mattress in queen, king, twin or a custom size, we can make it! You never have to wonder whether you’re getting the best memory foam mattress or not. If your new bed isn’t exactly what you were hoping for within 60 days, just bring it back and we’ll make it right! 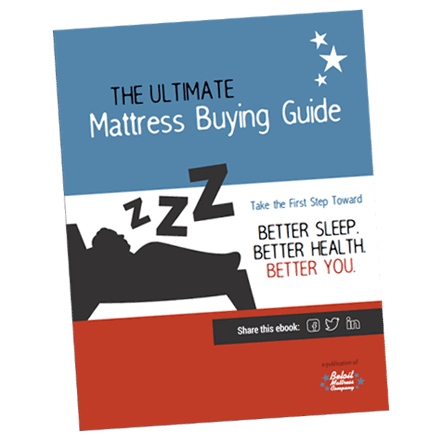 Want to Know the Difference in a Memory Foam Mattress and a Gel Foam Mattress? We don’t just offer the best memory foam mattress; we offer gel foam mattresses too! Find out which one might be best for you in our comparison of memory foam and gel foam.